The year was 1359. In the new kingdom of Lan Xang Hom Kao, a gift was given. A statue. But not just an ordinary statue: a golden standing Buddha image. The occasion was said to be a congratulatory gift from Phaya Sirichanta, the King of Angkor, in present-day Cambodia, to his Lao son-in-law on unifying realms into a single kingdom. The image, or the Phrabang, is where Luang Prabang derives its name. The Phrabang has a storied past. 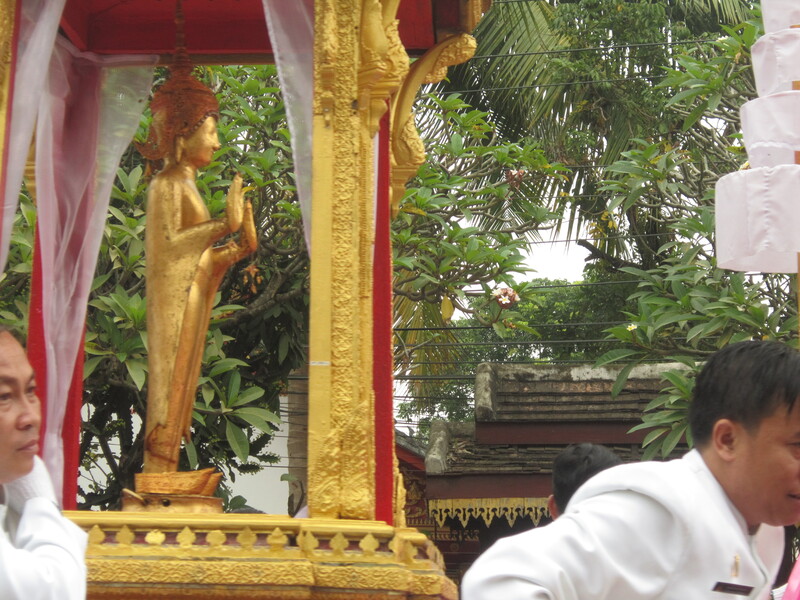 After being gifted to the great Fa Ngum, the Buddha image enjoyed many years in the ancient royal capital of Luang Prabang. In the late 18th century, the Phrabang was seized by the Siamese during an invasion. I was told that before eventually returning the image, several replicas were made and the Lao monarch was asked to choose the authentic Phrabang from among fake ones to repatriate. It has even been rumored that they were all replicas and that the real one was never returned. Either way, a Phrabang was brought back. Later, conflict and war once again brought about its relocation to Vientiane where it had been until fairly recently. On the morning of the 14th, I joined tens of thousands of spectators to welcome the Phrabang back to its original home in LP. Preparations for its arrival started years in advance with the construction of temple to house the Phrabang. Days before streets along the Phrabang’s path were cleaned and cleared. Elephants paraded around town in the early morning and music blast all day from loudspeakers along the main road. In the year and a half since I’ve been here, I’ve never seen the town in such a state. I asked my staff about the route of the Phrabang parade. One of the main streets in town had been originally considered to make up part of the route, but later after being notified by village elders that women’s skirts had historically been hung along that street it was deemed inappropriate to take the Buddha image along that path. 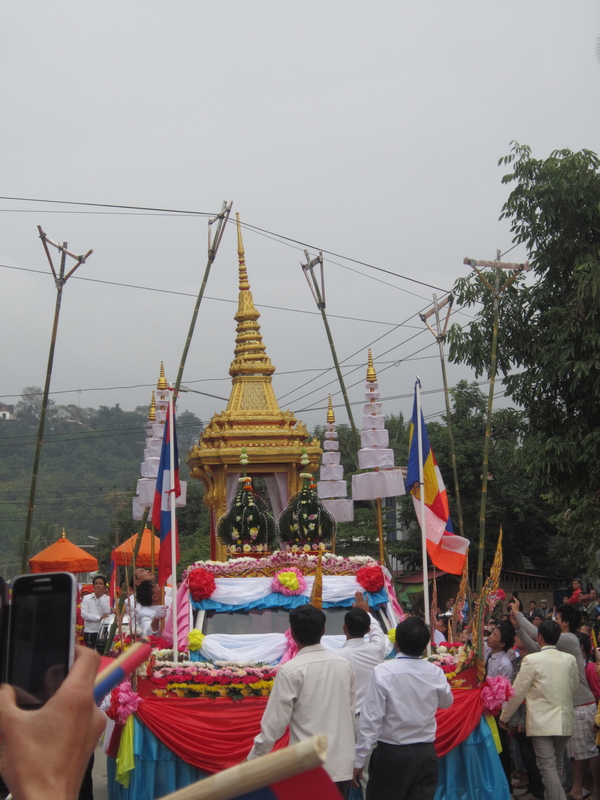 I was awaken at a quarter to 6 am by the blare of traditional Lao music and wild cheering. I wondered if I was missing either the elephants or the Buddha image. Turns out, it was just school children. With a 5 AM report time, they arranged themselves into a block formation. 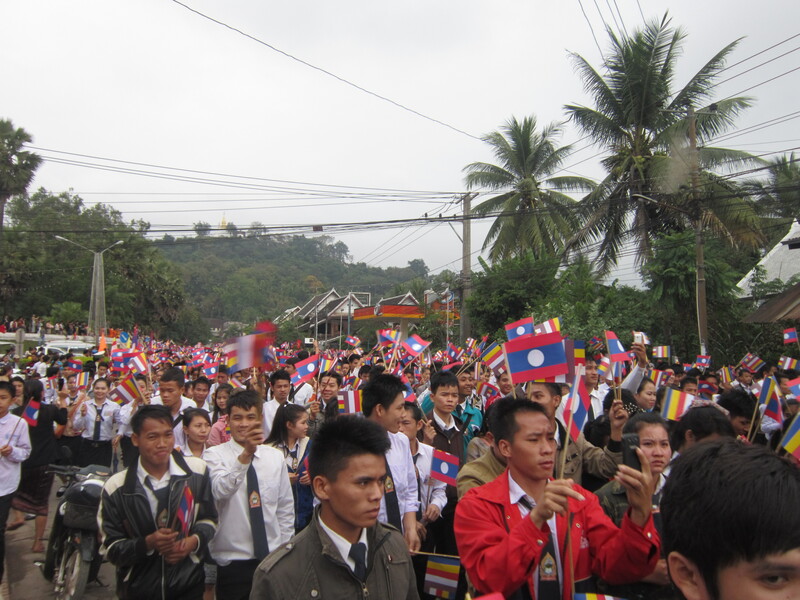 In uniform and wielding the Lao and the Buddhist flags they made their way to their watch point cheering cars and each other along as they went. We all waited in anticipation of the Buddha. As is often the case in our neck of the woods, information is unreliable or unavailable. 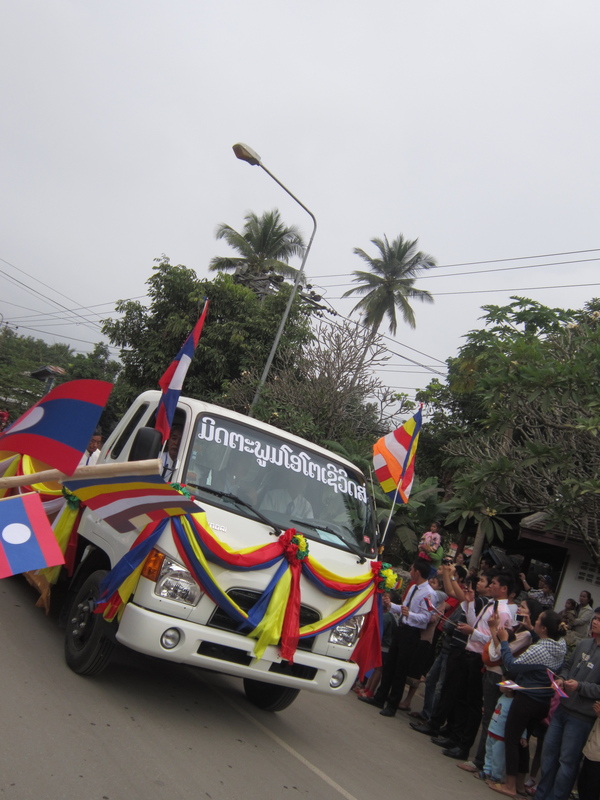 We assumed that because there were so many Lao people there, that it would have to pass by. It eventually did, and was preceded by musical ensembles, people carrying offerings, and a few men responsible for clearing power lines to make way for the Phrabang. One interesting thing I noticed was that Lao people don’t have cameras. They seem to either have nothing, or they have a smart phone or tablet. The tablets were particularly annoying as they obstruct much more of the view of people standing further back. The golden Buddha statue was cast in Ceylon, modern day Sri Lanka. The style, however, is consistent with 13th century Khmer sculpture. On my way to my office after seeing the Phrabang I ended up engulfed in a sea of flag-wielding school children. Later in the day, I went back out to catch the Phrabang again as it was passing nearby my office. It seemed that more people had joined the procession. It was definitely an exciting day in LP. For me, it was especially educative as I got to learn more about the history and culture of the place where I live.